Sometimes, the most powerful thing we can do is play music. 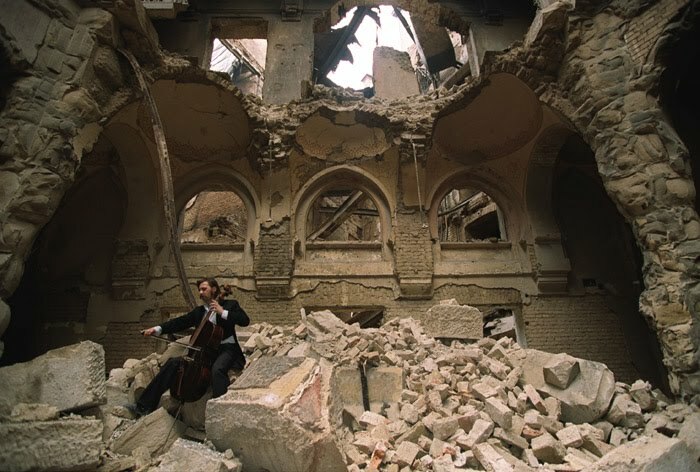 That is what Bosnian cellist Vedran Smajlovic did in some of the worst conditions Europe has seen since WWII. Smajlovic is a Bosnian musician born in 1956. He was living in Bosnia's capital, Sarajevo, when it fell under attack on April 5, 1992, during the Bosnian War. This year, 2012, marks the 20th anniversary of the devastating Siege of Sarajevo. A brutal blockade cut off electricity, food, and water, and the residents were under constant attack from snipers, bombers and artillery. When people lined up for the small amount of available food and water, they became targets. The Siege of Sarajevo lasted for four years making it the longest siege in the history of modern warfare. It was an extremely hard time for the people in the city, but Smajlovic stayed strong and found a strategy to keep his mind at peace. He played his cello at locations where people had been shot trying to get food or where a bomb had detonated. He also played for free at people's funerals. His music was offered in memorial to those who had died, making his own protest for peace. During the Siege of Sarajevo, the piece Smajlovic often played was Albinoni's Adagio in G minor. David Wilde, inspired by Smajlovic, wrote a song and dedicated it to Smajlovic. This clip is performed by Yo Yo Ma. Thankfully, Smajlovic survived the war. He continues to perform, conduct, and compose. He has also co-written a children's book with Elizabeth Wellburn, "Echoes from the Square" (1998). Smajlovic now lives in Northern Ireland. On the Bosnian war's 20th anniversary, Smajlovic returned to Sarajevo. Although he has visited the city before, this was his first concert since playing in the streets during the war. He played a concert for journalists who had covered the war during its time. He was accompanied by members of the Sarajevo String Quartet. The Sarajevo Quartet had played over 250 concerts in bomb shelters, schools, and hospitals. "They were hungry, but still had soul", Smajlovic said. And before playing with the quartet, he prefaced the piece "Remembrance", written by Smajlovic himself, with "You lost friends, I lost so many friends."